Very friendly and helpful personnel. Only complaint is sites are too narrow. We couldn't let our awning out but for a few feet and even though we parked as far as possible from neighboring site our big slide encroached at least 1 ft. on pad next to us. Park is convenient to downtown Fredericksburg. We camped at Oakwood RV Resort in a Fifth Wheel. They put us in a really difficult spot to back into, but the park itself was quite nice and reasonably close to town. My sewer hose (15') wasn't long enough to connect, which wasn't ideal, though we just used the dump station. The WiFi was good, though I was close to the antenna. Thankfully, one of the folks who worked there temporarily was a truck driver who helped me back into this very tough spot. I didn't enjoy the town very much (horrible food, no night life, subpar vineyards), but the park was otherwise pretty nice. The staff was friendly and accommodating. 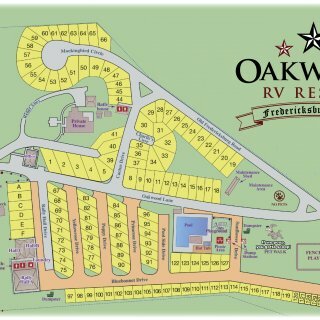 We camped at Oakwood RV Resort in a Fifth Wheel. I made reservations on line. When we got there and went to our site, it was not good. We called the front office and ask them about the site in front of our site. They said they would have to charge us another five dollars for each night. I ask why and they said that site had a bench. Really? Nice pool, but the dog walk was too far. Would I stay there next time.? No. We camped at Oakwood RV Resort in a Fifth Wheel. Very nice park, friendly staff, entrance is a little tight with rig. All sites have concrete pads but everything else is gravel. Nice pool, hot tub is like one you might find on someone's deck. They have free small bags of ice just enough for a small cooler. Sites were very narrow as my slide went over my neighbors pad. My sewer hook up was right next to their pad also. I recommend a site on the end so you can avoid having someones sewer and slide on your site. We camped at Oakwood RV Resort in a Fifth Wheel. Rate reflected is for one month; electric was an additional .12 per kw. If there were other options available for the time we needed we would have moved on quickly. This park has "10" ratings but I suspect it has not been visited in quite some time. It is fine for an overnight or two, clean and safe, but it is not a resort or anything near a "10". Most of the sites are pull through with very little space between rigs, it does not invite pulling out the camp chairs and very few did so. The sites are gravel and during a rain the roads are rivers. The entrance to the park is very tight and many struggled with the turn. We were in one of the lettered sites which are back-ins. The sites have very narrow entrances with cement patios and misplaced shrubs at the entry. If there is no one across from you it is not bad but that is not usually the case. The big green space fronting the road is mowed but the small spaces between the lettered sites were not mowed the entire month we stayed. Knee high weeds are most attractive. The laundry room was clean and the power was fine. We camped at Oakwood RV Resort in a Fifth Wheel. Very nice park in a great location. The $18 rate is what we had on a monthly rate with electricity. Super friendly staff. The very best swimming pool we have ever encountered at an RV resort. Sites are just a bit on the small side, or I would have rated them a 9 or 10. Would definitely come back. We camped at Oakwood RV Resort in a Fifth Wheel. I stayed here for the first 3 days with Passport America, and the rate was less. After the 3 days, I went in to explain that I didn't feel well and wanted to extend, could they give me the same rate - no, but they would give me the Good Sam rate. Apparently, since I was PA, I was assigned a site in the full sun (charged extra since it was a pull-thru) for the full day, even though there were nicer, shaded sites available. The facilities were OK, except for the laundry - the dryers seemed to be a good deal until you found out that it took way too long to dry clothes since it was all low heat. Wouldn't stay here again, I'm sure there are more nice places in the area. We camped at Oakwood RV Resort in a Fifth Wheel. Meh. This was an OK park. The spots were VERY NARROW and CLOSE TOGETHER. I think this is an older park that was not originally meant for the larger rigs out on the road today. Slide-outs hang over the concrete pad with the picnic table and into the spot next to you. The rows are narrow and it's hard to get your rig in and out. Much of the park was full with people who live there and work in town and park their cars in front of their rigs, crowding the roads in and out of the park. Consider this park if you have a smaller rig, under 24 feet. It will make it a lot easier to get in and out. At 36' plus our truck, it was a tight fit. Very quiet park, hardly any noise. Dog park was a little small for our big dog, but would be fine for a medium or small dog. Too cold to use the pool but it looked very nice and well-maintained. Only 4 washing machines in the laundry for over a hundred sites. Overall an OK stay. We camped at Oakwood RV Resort in a Fifth Wheel. In the middle of the park are 30 pull throughs and 6 back-in for short term parking. The rest are all back-in’s located around the perimeter of the park, set up for seasonal or full time residents(with electric meters). All of the sites around the perimeter have lots of shade trees. The sites in the middle have nuisance decorative trees and shrubs. All the roadways and pads are pea gravel that just loves to get stuck in your tire treads. Water pressure at the site was nominal at 40 psi. Each site has a concrete pad with a picnic table, but the problem is that the space between the concrete pads is narrow, making positioning of your rig a real challenge. Beside the electrical pedestal was a large Cable box that sat 24” into the site, reducing the available maneuvering space from 11’ to 9’, not much allowance for a 8 ½’ wide rig. All the other sites did not have this problem so avoid site #91 if you can unless you have the ‘turn thing’ down pat. The spacing of the decorative trees and shrubs caused problems with trying to position our 4 slides. The sewage opening is actually in the concrete patio of your next door neighbor, sitting it about 8” above the ground. By the time you screw in your connecting elbow, the opening at good 12-14” above the ground. No matter how hard you try, crap does not flow uphill. In our site, the tree on left side of site overhung the parking spot and as we attempted to pull in, we were pushing branches out of the way. I eventually backed out and went around again and went over to the right as much as I could. I asked the staff to trim back the tree as it overshadowed the site, but they refused. The WiFi was free, but pathetic. The connection was slow and unreliable and disconnected frequently. We will not stay there again. We camped at Oakwood RV Resort in a Fifth Wheel. Very clean park and there are several sites with large trees. The restrooms were kept very clean. They also have a meeting hall if you have a group traveling together or meeting at the park. All the employees were very friendly. They are in the process of installing Wi-Fi so some sites have bad connections. I use a cellular modem so it was not a problem. The Park is very close to the Airport, Fairgrounds, and Downtown. 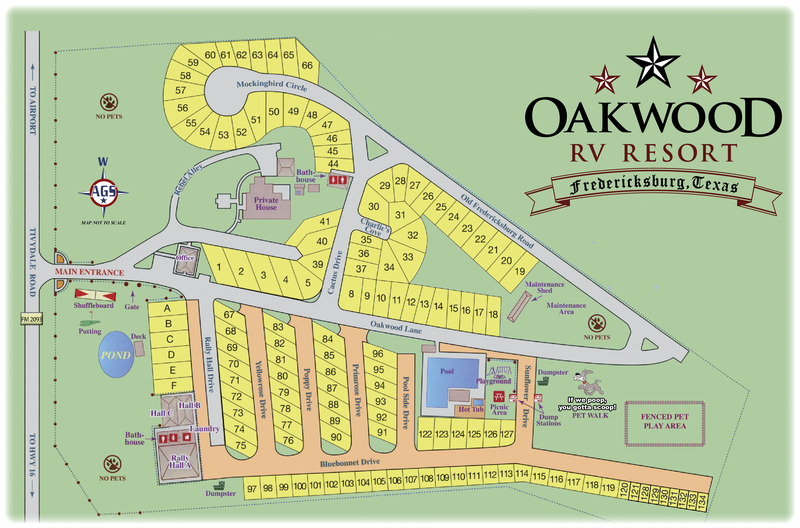 We camped at Oakwood RV Resort in a Fifth Wheel.